You just graduated from a university. Thinking about a new startup and got an excellent idea. You have prepared a business plan. According to your plan, you need to invest 50,000$ in your business. Within a year, you can expect a profit of 400,000$. But there is a 50/50 chance that you may lose all of your investment money and gain nothing. Your business plan is so solid that, one of your friends proposed you to buy out the business plan from you for 5,000$. The condition is that, you won't execute that plan, rather your friend will do that. Your friend will invest his money and take the risk. You simply get certain 5,000$ for giving up the business opportunity. What do you think? will you give up the business opportunity for 5,000$? If yes, then, in economics term, this 5,000$ is the Certainty Equivalent for this uncertainty (business). Therefore, Certainty Equivalent is the amount of Money that is equivalent in your mind to a given situation that involves uncertainty. A guaranteed return that someone would accept, rather than taking a chance on a higher, but uncertain return. Say, you are not convinced with that selling price for your business plan. But you do not know exactly what should be the right price to sell out your business plan. Perhaps, you should ask more than 5,000$? How can you figure out? Is there any way to find that number mathematically? We have learned that utility function maps a real-world value to a satisfaction level. If you can model your utility function for monetary gain from a risky investment (like this one), then using that utility function, you can calculate your certainty equivalent. Say, your utility function is U(x), where x is the real world monetary gain from risky investment. Based on that utility function, you can calculate the Expected Utility of the above investment using the formula of Expected Value of a random variable. So, whatever is your utility function, you pass that real-world value 400,000 and -50,000 to your utility function. In that way, you will get a number for Expected Utility EU, right? Once you get the Expected Utility, you need to find the Inverse Function of your Utility Function and pass the Expected Utility value to that Inverse Function. By doing so, you will get the Certainty Equivalent. If you are not familiar with Inverse Function, then here is the simplest explanation. Say, you have a function f(x) = y. For various input x, you get various output y, right? The inverse function of f(x) is a function that will find out, for what input value "x", you will get a given "y" value. Let's say, you modeled your Utility function using Rational Will, like this. So, your Certainty Equivalent for this uncertain investment should be 60,000$, not 5,000$. You should ask 60,000$ to your friend for selling out the business plan according to the given utility function. Start the "Decision Tree Software" software. Then, click "Model your Objectives". Once you click the button "Identify your Objectives", you will be presented to the following screen. Your ultimate objective is to maximize the money in your bank, right? So, select "Maximize" in the drop-down box and enter "Money in bank" in the text field as shown below. Then click "Proceed". Now, you will be asked the type of your objective. You can click either "Numerical Type" button or "Money Type" button. Money Type offers more feature like calculating Net Present Value based on interest rate and future pay off date. But, for this simple example, we do not need to calculate Interest Rate based NPV calculation. So, click the "Numerical Type" button. Then click "Proceed". You will be asked if you have any more objectives. For this example, we don't, so, click NO. Now, you will be asked to create the Decision Tree. 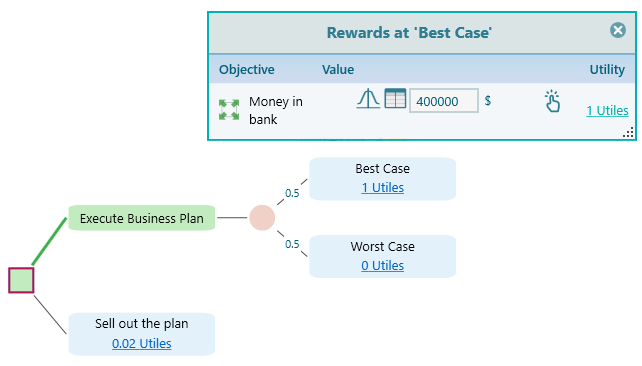 Before you start the Decision Tree, you can model the Utility Function. So, click the hyperlink "Objectives" to navigate to the Objectives page. Once you click that button, you will see the Objectives. Double click on the Objective "Maximize Money in bank" to open the Objective editor. You may choose to express your Utility value in 0 to 1 as shown in the above screenshot. Once you do that, you can double click on the Chart Panel to add a utility point. You can use Mouse drag and move to move any utility point in any direction you want. Finally, add some utility points and move them as shown in the following screenshot. Then click the "OK" button of the Objective Editor. Then click the button "Work on Decision Tree"
Once you click that button, you will be taken to the Decision Tree start page. 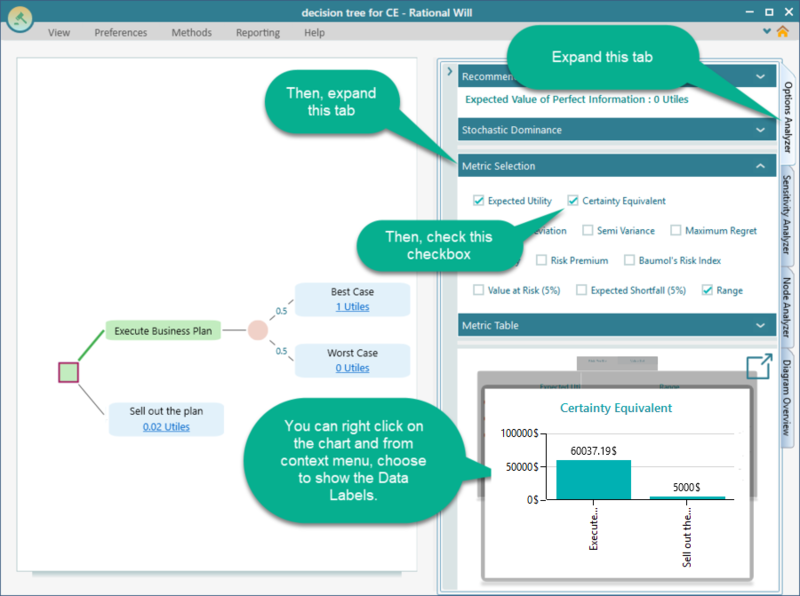 Once you click that "Decision Node" button, you will be taken to the Decision Tree diagram page. Learn how to use the Decision Tree tool from this page. 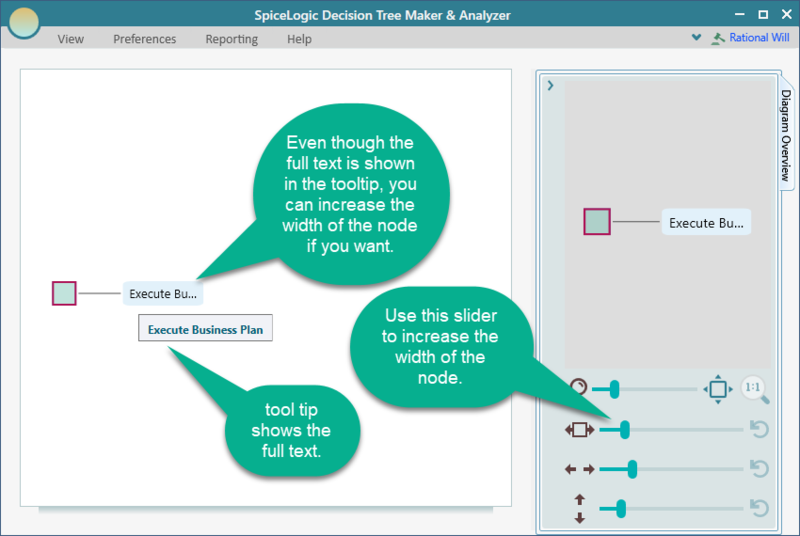 Create a Decision Tree as shown in the following screenshot. We have explained that you can change the Diagram aesthetics. Here is a quick tip. Anyway, select the "Best Case" node and attach a reward as 400,000$. Same way, attach a reward to the Worst Case as -50,000. Also, select the node "Sell out the plan" and attach reward = 5,000$ which your friend proposed you. Then expand the "Options Analyzer" tab. Within the Options Analyzer, you will see a section named "Metric Selection". Expand that tab. Within that Metric Selection panel, check the checkbox "Certainty Equivalent"
From the Certainty Equivalent Chart, you can see that the "Certainty Equivalent" value for "Execute Business Plan" option is 60,037$, which is close to what we saw in the Utility chart. From the Certainty Equivalent Chart, we can see that the Certainty Equivalent for "Executing Business Plan" is much higher than the value for Selling out the business at 5000$. So, if you stick to the same utility function, then you should not sell out the business plan. You can sell if you can get almost 60,000$ for the plan.